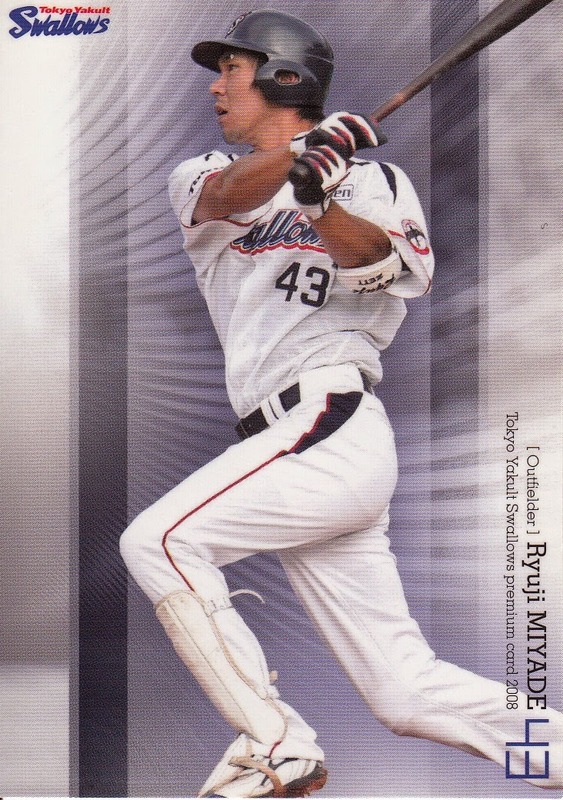 It's that time again - the latest issue of Sports Card Magazine (#110) hit the shelves in Japan on Saturday. My copy showed up yesterday. The cover price of this issue was 2110 yen, which is over 300 yen more than last issue and a whopping 1100 yen over what issue #102 cost (the last issue in 2013 before SCM went to 12 insert cards per issue). I'm not exactly sure what caused the jump in price and I'm not positive that it will be permanent. 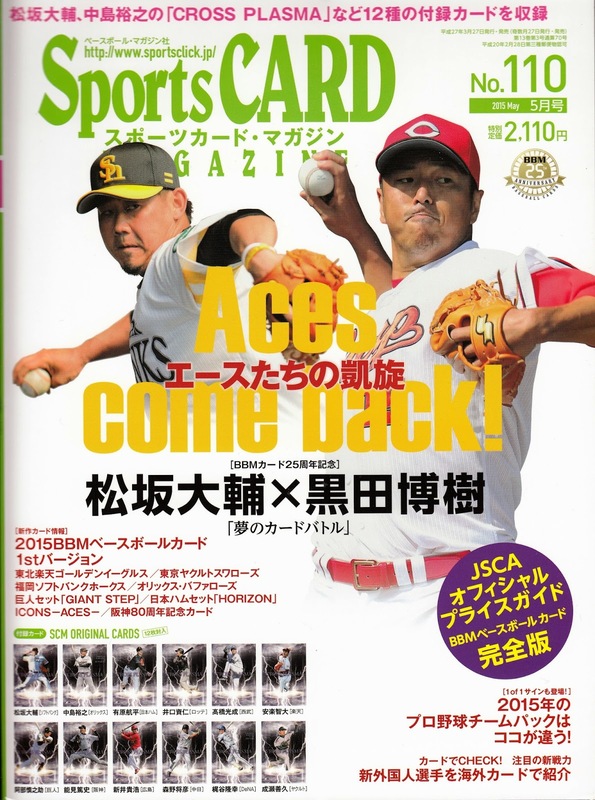 The cover story deals with Daisuke Matsuzaka and Hiroki Kuroda and their return to Japan. 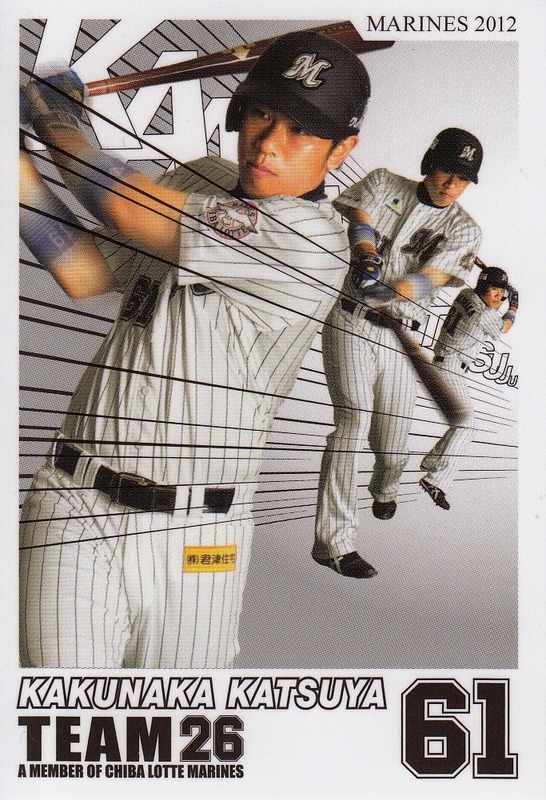 It's kind of interesting even if I can't read the article - it shows a bunch of cards for both of them (all BBM of course) and has little head to head competitions between comparable cards - best rookie card (Matsuzaka's 1999 card over Kuroda's 1997 card), best autograph card (Kuroda's 2004 Carp Expert over Matsuzaka's 2003 Lions), best game used memorabilia card (Matsuzaka's 2002 1st Version Glove card over Kuroda's 2005 2nd Version Undershirt card), best insert card (Matsuzaka's 2002 Touch The Game All Star over Kuroda's 2007 Carp Shining Star), best parallel (Kuroda's 2007 1st Version "1 of 1" over Matsuzaka's 2006 2nd Version "hologram autograph") and best MLB memorabilia card (Kuroda's 2014 Topps Supreme autograph & patch card over Matsuzaka's 2013 Topps Five Stars Golden Graphs autograph card). 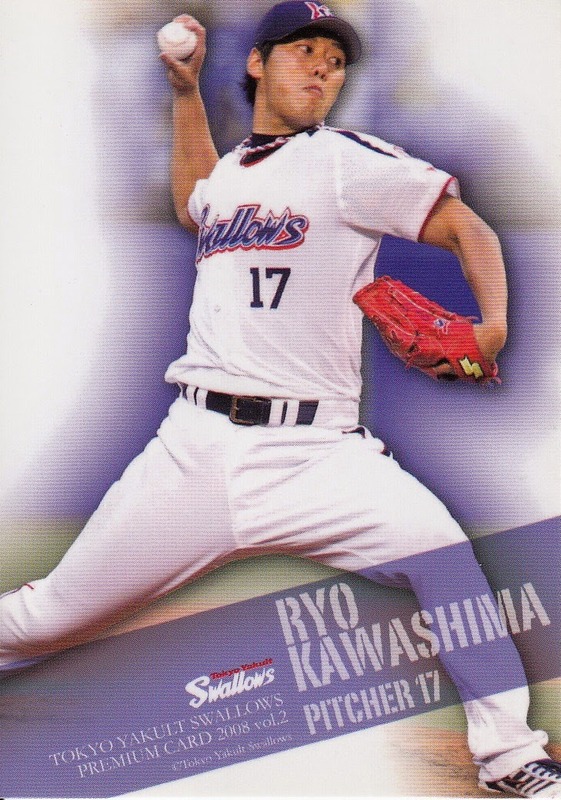 The color section also contains a two page article on BBM's first four team sets for 2015 (the Eagles, Swallows, Buffaloes and Hawks) which also contained a schedule for the release of all the team sets in 2015 (Carp, Fighters and Dragons will be out in late May, the Tigers will be out in early June, the Marines and Baystars in late June and the Lions and Giants in early July). Most of the remainder of the color sections is ads for BBM's recent and upcoming releases - 1st Version (2 pages), Eagles, Swallows, Hawks, Buffaloes, Giant Step (half page), Fighters Horizon (half page), Icons - Aces and Tigers 80th Anniversary. The most significant new piece of information out of these pages is that 1st Version will have team checklists and they will be the team mascots yet again. 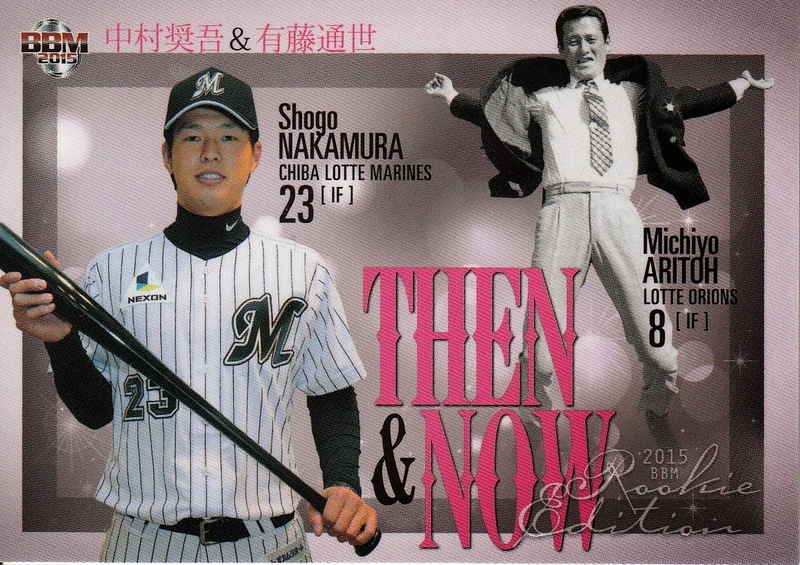 The most interesting piece in the "newsprint" section is an article on all the new foreign players in NPB for 2015. 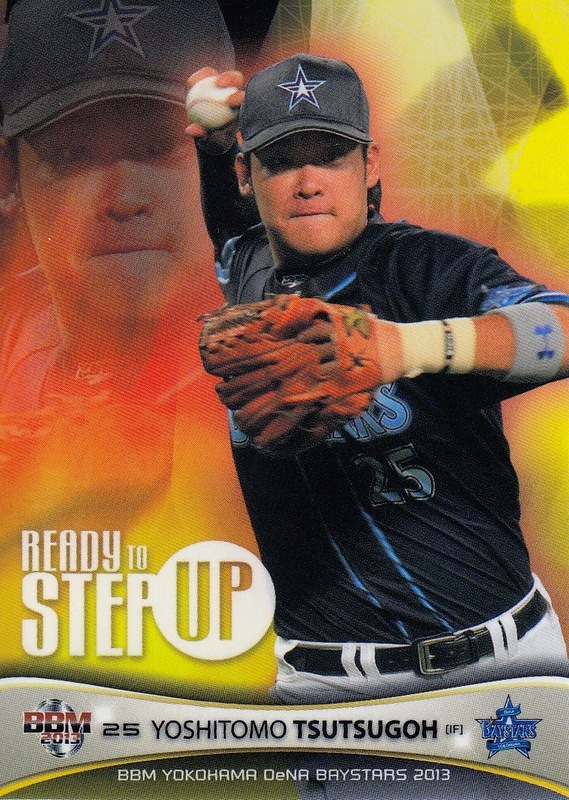 This article shows US cards for a number of the players including Topps, Bowman, Panini and even a Tennessee Smokies card of Marines pitcher Dae-Eun Rhee. There are checklists for all the BBM issues shown in the color section and the revolving vintage checklist and price guide is for all of BBM's baseball cards (as predicted). Finally, the best part of each issue is usually the enclosed baseball cards. This issue has 12 "Cross Plasma" cards. 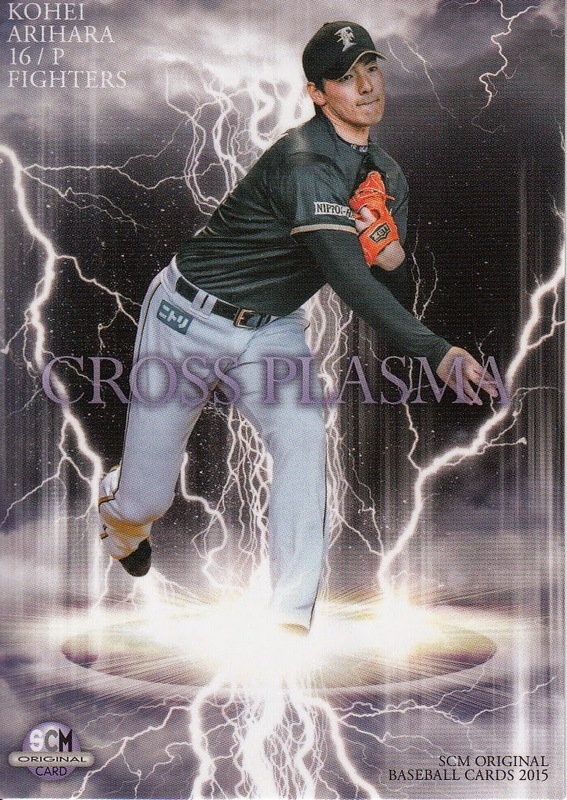 "Cross Plasma" is this year's cross set subset for BBM. 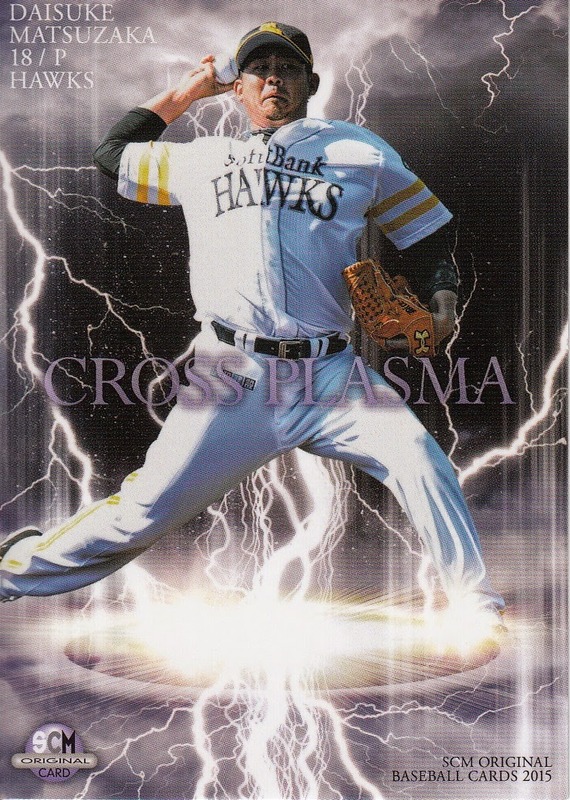 There are 36 "Cross Plasma" cards in the 1st Version set and if BBM continues what they've done in past years, there will be 36 more cards in each of the 2nd Version and Genesis sets. These 12 cards (one for each team) are not promo versions of 1st Version "Cross Plasma" cards but bonus ones - they are numbered CP 37 to CP 48 while the "Cross Plasma" cards in 1st Version are CP 1 to CP 36. 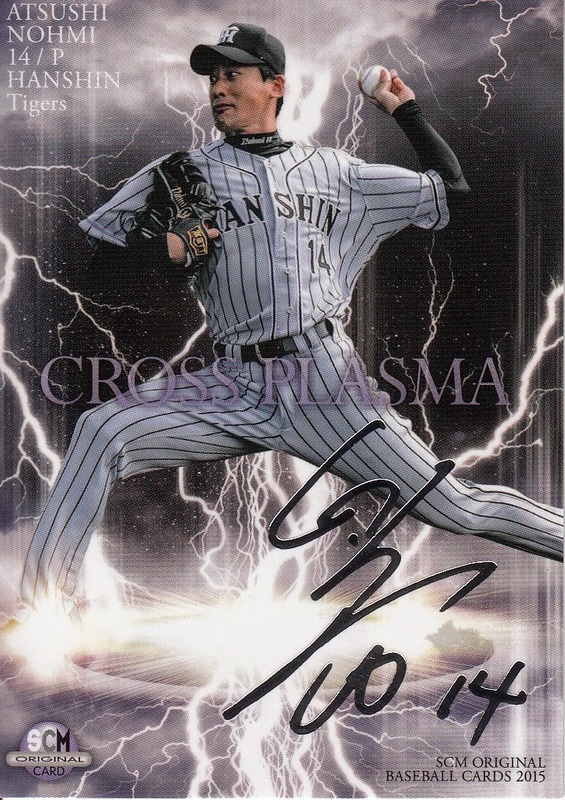 I'll be curious to see if BBM does this two more times this year - making it 36 SCM "Cross Plasma" cards to go with the 36 in each of the "flagship" sets. All 12 cards can be seen at Jambalaya. To continue my posts on team issued sets, I thought I'd do a quick one a couple sets I have cards from for the Marines. 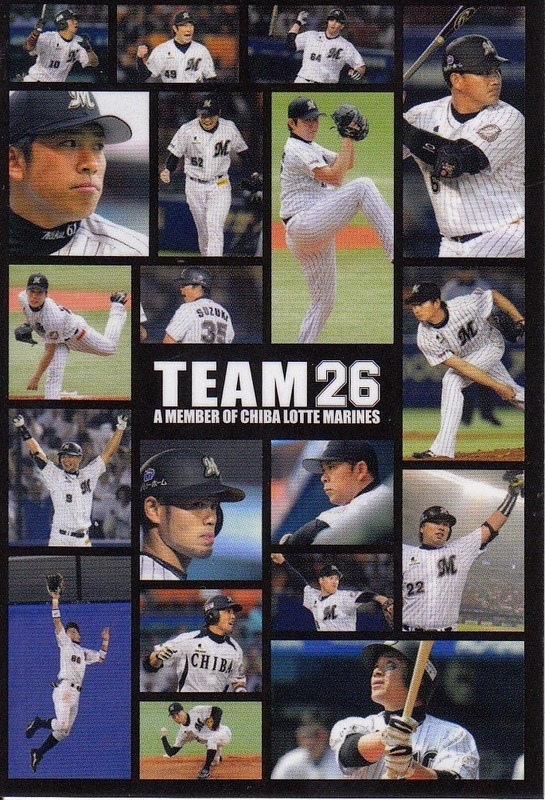 These sets were issued through the Marines Fan Club called Team26. 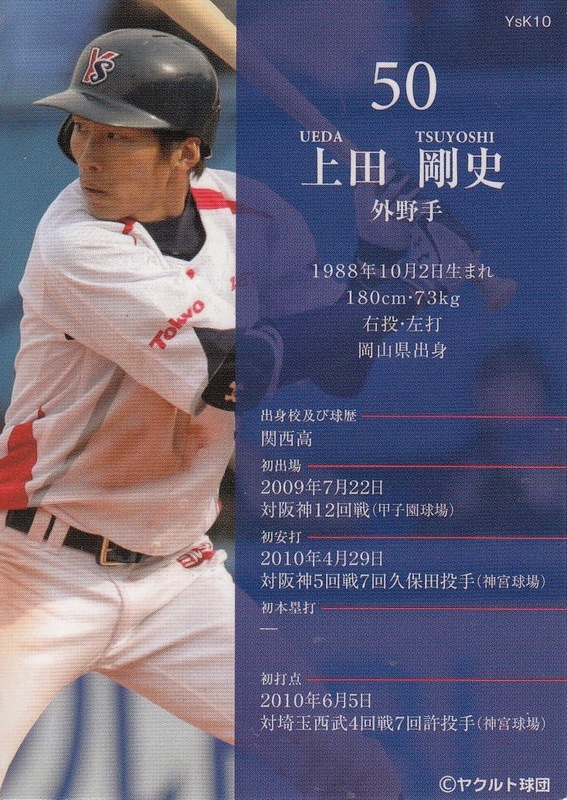 The cards are unnumbered except for the player's uniform number. 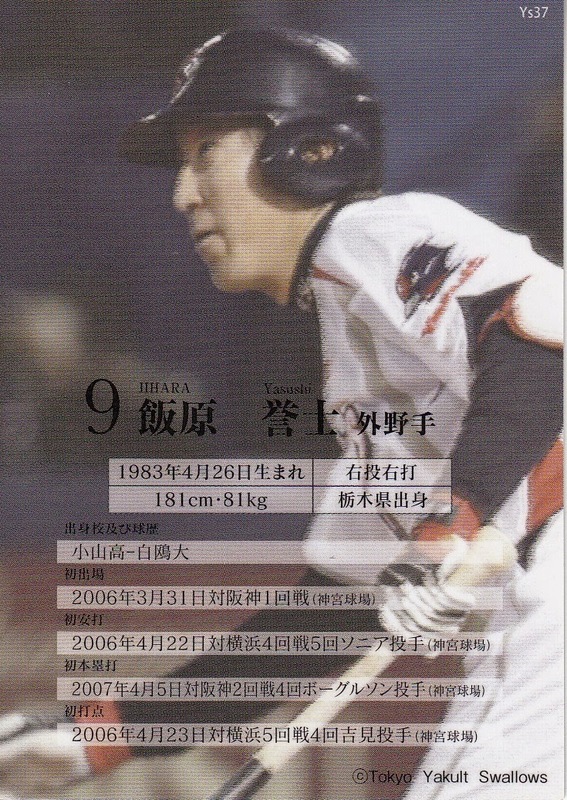 The cards I have are Toshiaki Imae (#8), Yoshihisa Naruse (#17), Yuki Karakawa (#19), Tomoya Satozaki (#22) and Yoshifumi Okada (#66). Like the 2011 cards, the 2012 cards are unnumbered except for the player's uniform numbers. 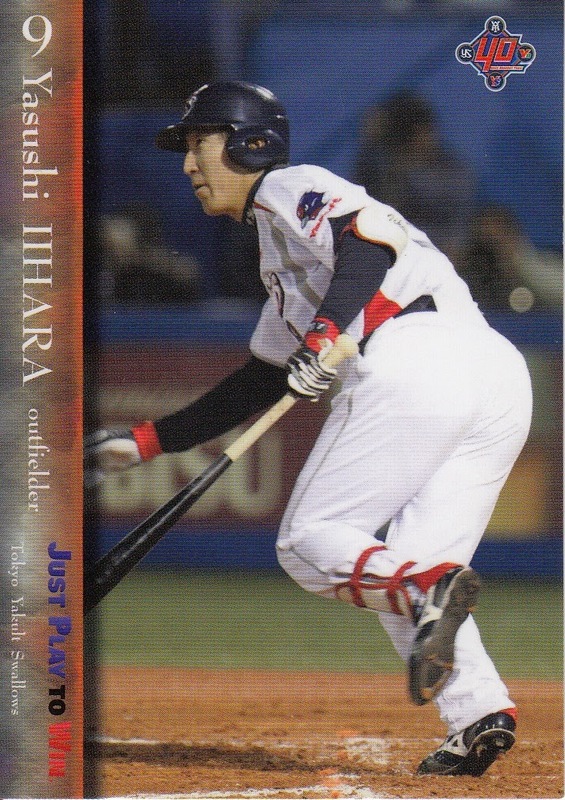 The five players I have are Tadahito Iguchi (#6), Toshiaki Imae (#8), Yoshihisa Naruse (#17), Yuki Karakawa (#19), and Katsuya Kakunaka (#61). 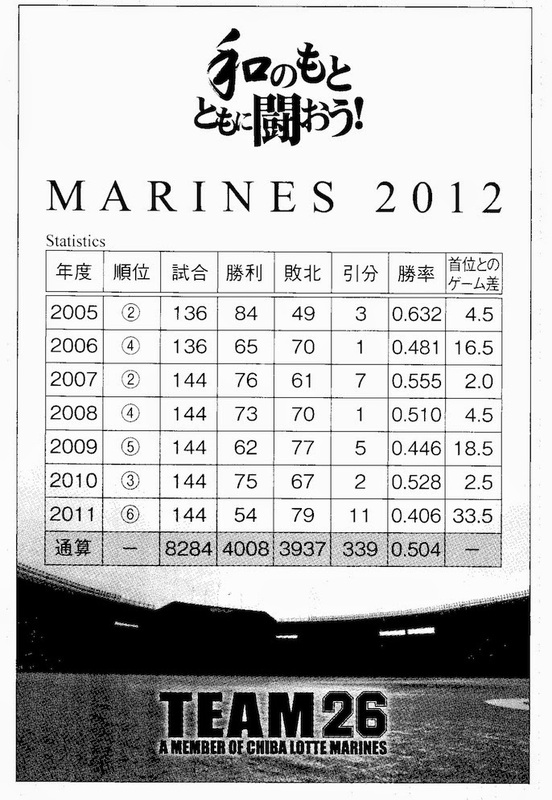 Sports Card Magazine (SCM) is published six times a year by Baseball Magazine Sha. 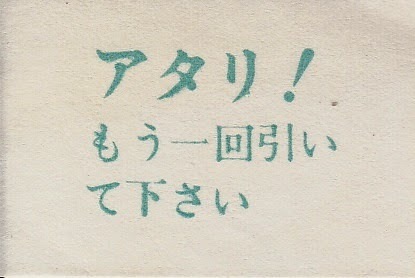 There is a vintage card checklist in each issue, the contents of which rotate from issue to issue. I confirmed tonight that there's an actual pattern to this rotation. Now granted, this isn't exactly on a par with cracking Enigma or (more appropriately) Purple but it did take having enough issues on hand to figure it out. I put it all in table form. The four columns on the right are all the recent issues of SCM that I have (per year of publication date) which I used to confirm this rotation. I want to note here that SCM actually uses the English word "soccer" in labeling those two checklists which I find kind of surprising. I have a couple issues from 10 years ago that do not follow this pattern so I don't know how long ago this particular sequence of vintage checklists started. And of course, past performance is no guarantee of future performance. But I'm pretty confident right now that SCM Issue 110 (which comes out Saturday) will have the complete BBM listing for its vintage price guide. BBM is finally starting to get caught up on their upcoming releases. They put information for a couple new ones up on their website in the last week or so. 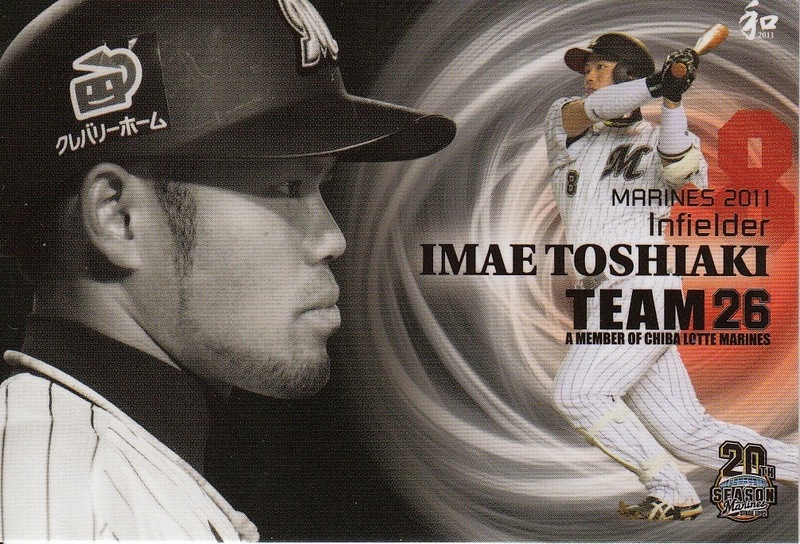 - As I think everyone expected, BBM is issuing an 80th Anniversary set for the Hanshin Tigers. 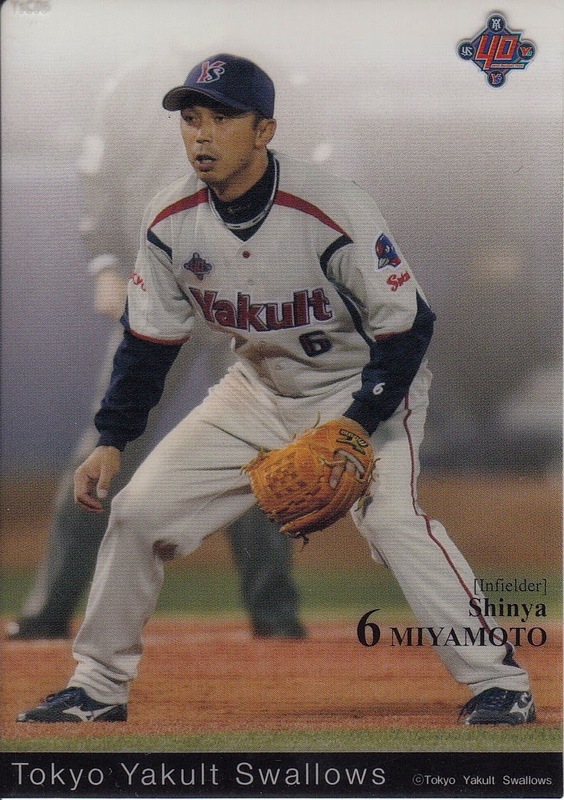 At 81 cards in the base set, this set is smaller than either of the two previous Tigers Anniversary sets - the 70th in 2005 and the 75th in 2010 - which both had 99 cards in the base set. There's pretty much no subsets in the set, just a difference between whether the player is an OB player (66 cards) or a current player (15 cards). 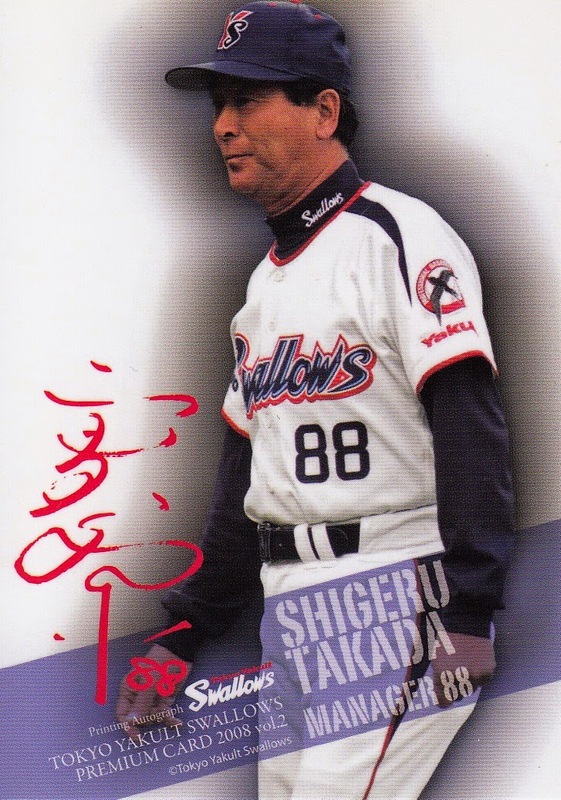 There's a 15 card "Tigers Heroes" insert set and the usual assortment of autographed cards. The set will be out in late April. - The next two of BBM's annual team sets will be for the Buffaloes and the Hawks. Both are pack based sets with 81 cards in their base set. 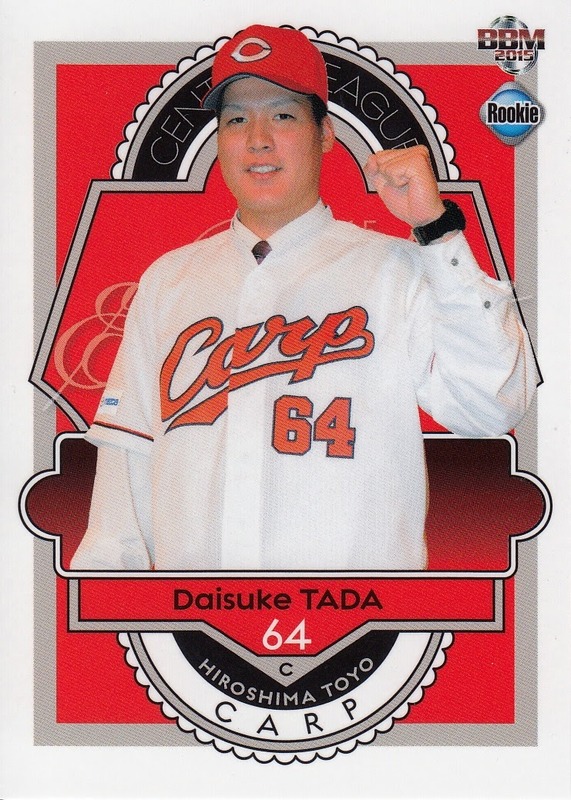 The Buffaloes base set will have 69 "regular" cards (for the manager and players), two checklist cards and an unidentified 10 card subset. There will be three insert sets - "Bs Triplets" (3 cards), "Lockdown Relievers" (6 cards) and "Horn Attack" (9 cards) - and numerous autograph cards, including dual signature ones. The set will be released in early April. 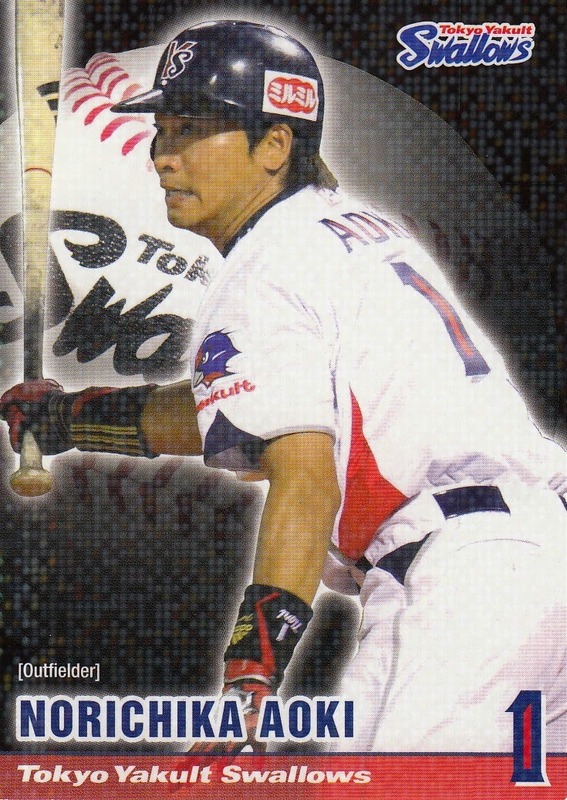 The Hawks set will have 68 "regular" cards (for the manager and players) and a number of subsets - a three card Daisuke Matsuzaka puzzle, three "Road To Record" cards, four "2014 Award" cards along with three single card "subsets" - "Next Decade", "2014 Japan" (Nippon Series Champs?) and a checklist. 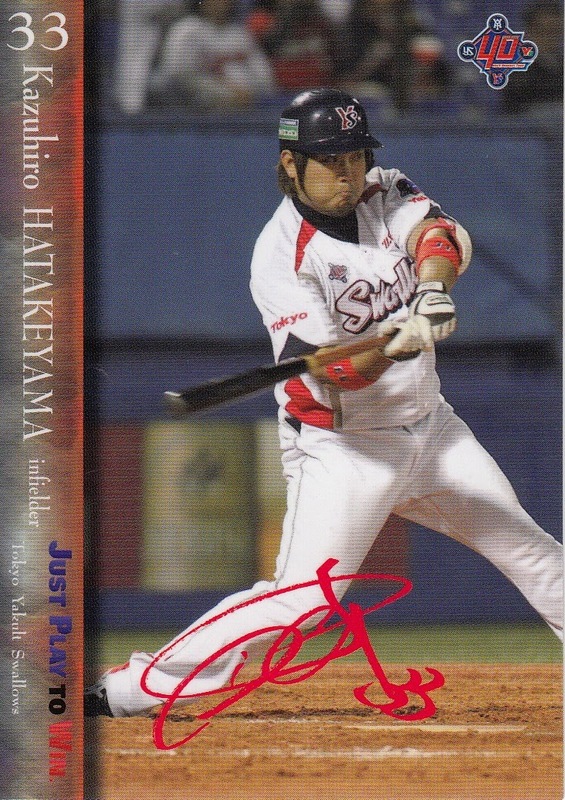 There are two nine card insert sets called "Super Hawks" and "Hyper Hawks" and a wide variety of autographed cards. This set will be out in late April. 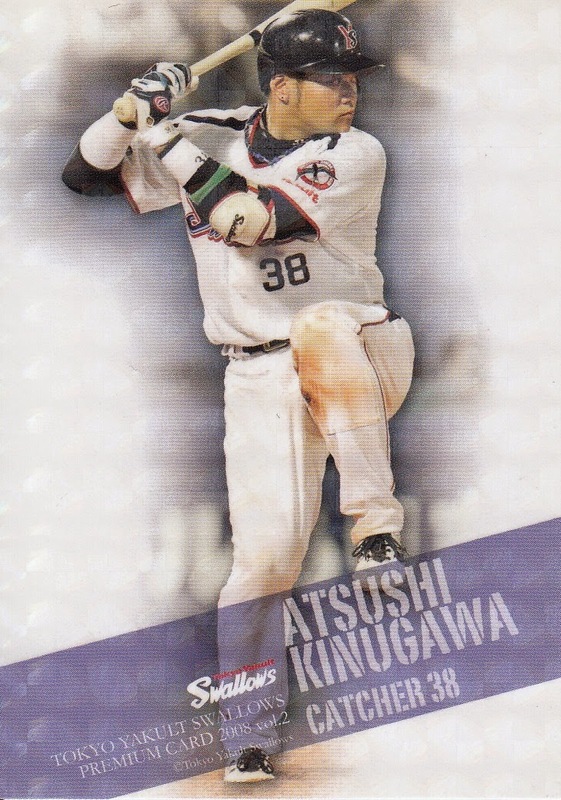 Probably the biggest category of uncatalogued modern (post 1991 cards) Japanese baseball cards are those that are issued either by the NPB teams themselves or their official fan clubs. I think the latest edition of Engel that dealt with modern cards only listed a couple sets and that's over six years out of date now. 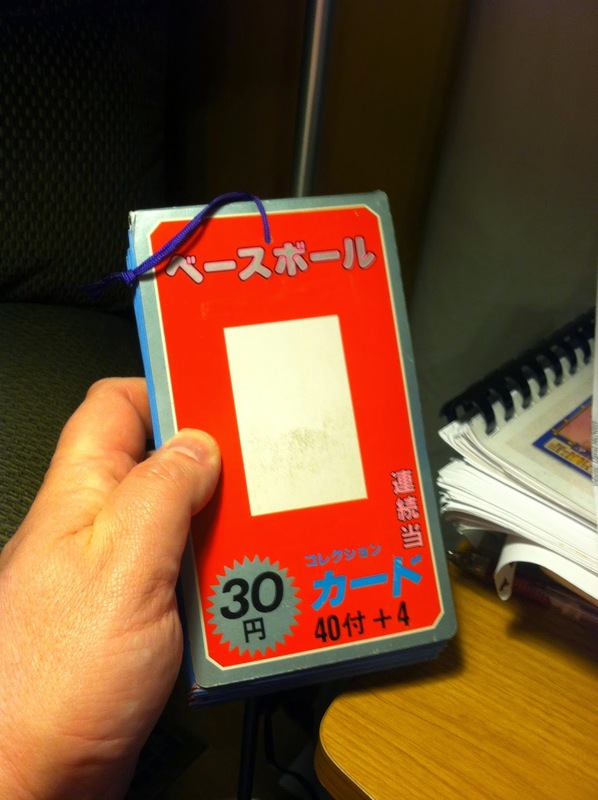 Jason did a post from a few years ago listing all the cards from all the sets that he has located (and he's still updating this post as he learns about new stuff) which is probably the most comprehensive listing of these cards that exists in the English speaking blogosphere. I don't intend to change that, but I did think that I'd start doing some posts on some of the team sets (OK, cards from team sets) that I've been picking up lately and provide a complement to Jason's post. I thought initially that there was also a "red facsimile autograph" parallel for this set as well, but when I looked closely I realized that these cards were actually from another set - a "Printing Autograph Premium Card Vol. 2" set. 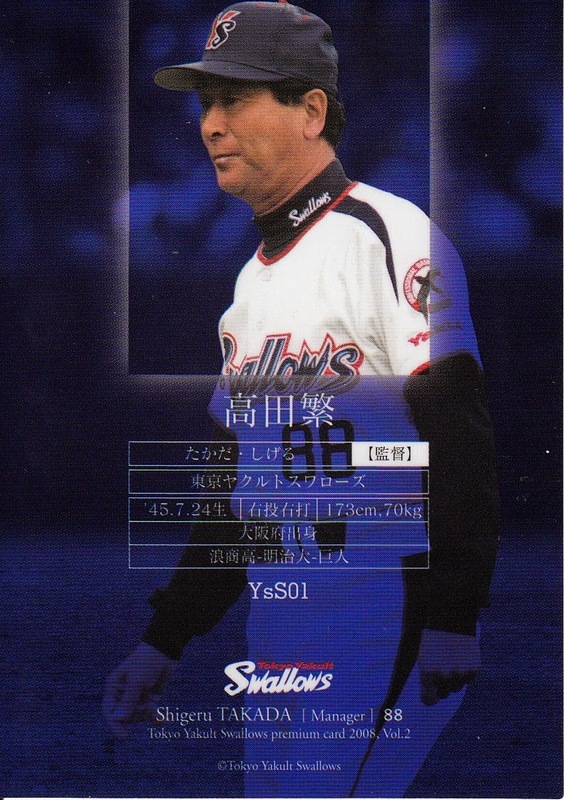 I have three cards from this set as well - Shigeru Takada (#YsS01), Masanori Ishikawa (#YsS04) and Tatsuyoshi Masubuchi (#YsS05). 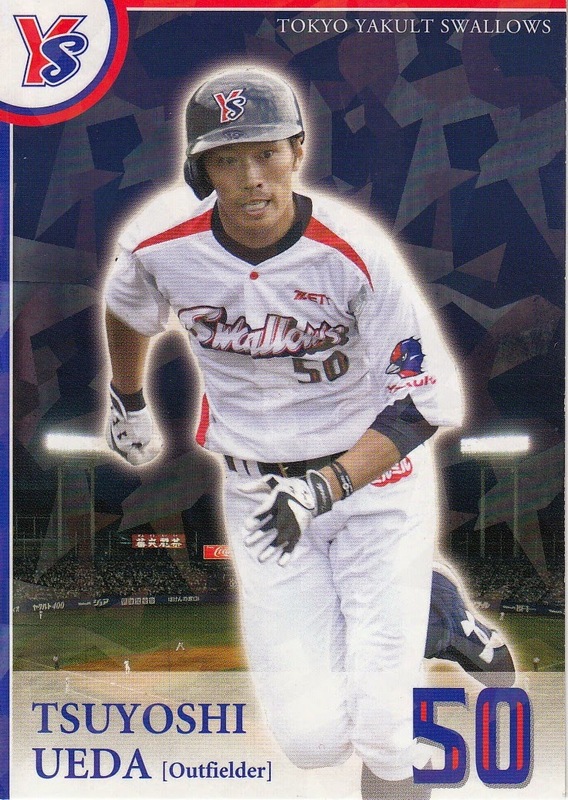 The Swallows did something similar for 2009. I have one card from a "plain" team set and two cards from a similar looking set with a red facsimile autograph. I'm not sure what (if any) name the set has. The next cards I have are from 2011 and again there are two similarly looking sets - one with no autographs and one with autographs. Again there is no indication on the cards what the name of the set is. The only cards listed here that explicitly list the year they came out are the 2008 cards. 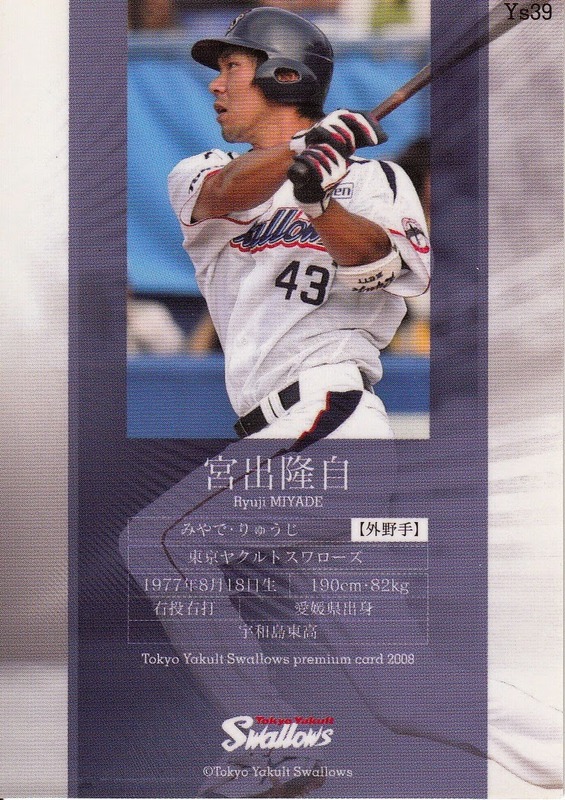 The cards I think are from 2009 have the "Yakult 40th Anniverary" logo on them which is why I figure they are from 2009. 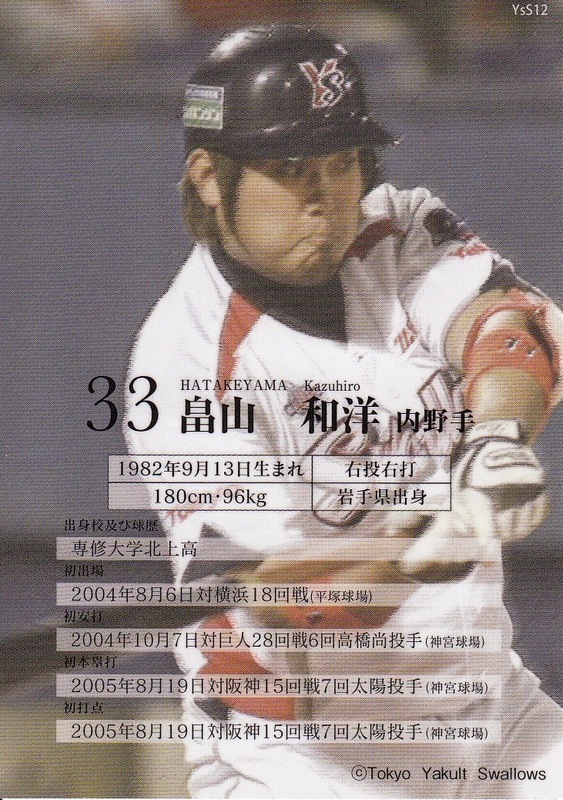 I'm going by what the seller of the cards said for the 2011 and 2012 cards so it's possible that those are not correct. I don't know how these cards are distributed - if it is by pack then it wouldn't surprise me to discover that the facsimile autograph cards as well as the "clear" and "kira" cards are insert sets associated with a base team set. 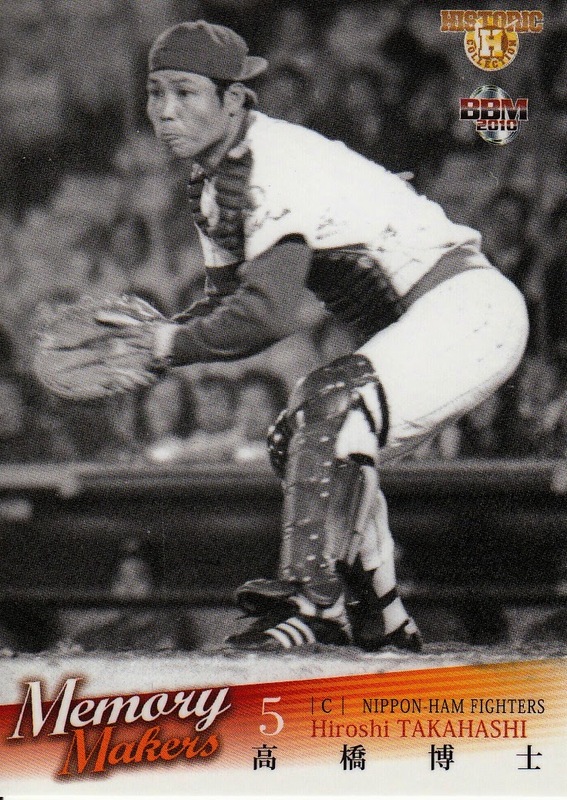 Autographed copies of Rob Fitts' latest book (Mashi: The Unfulfilled Baseball Dreams of Masanori Murakami, the First Japanese Major Leaguer") are now available from Rob's web site and unautographed versions can be pre-ordered from Amazon (the book goes live next week). 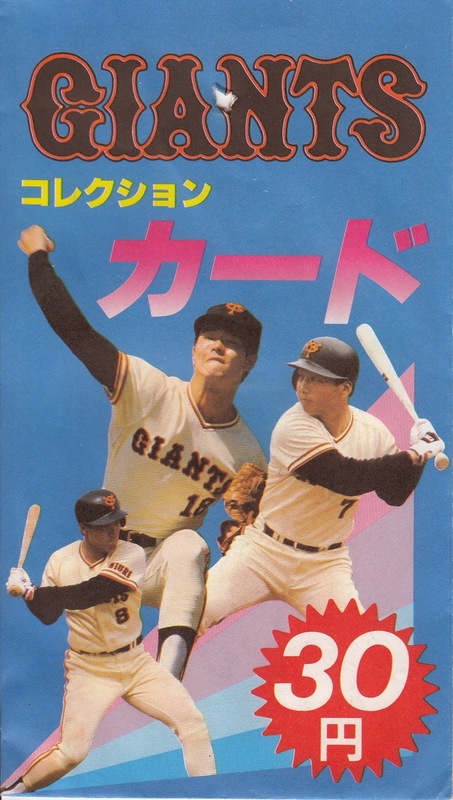 I was looking at Rob's Kickstarter page (for bringing Murakami to the US this summer for a book tour) and I couldn't help but wonder about something - the Nankai Hawks sent three players to the US in 1964 to play in the San Francisco farm system. 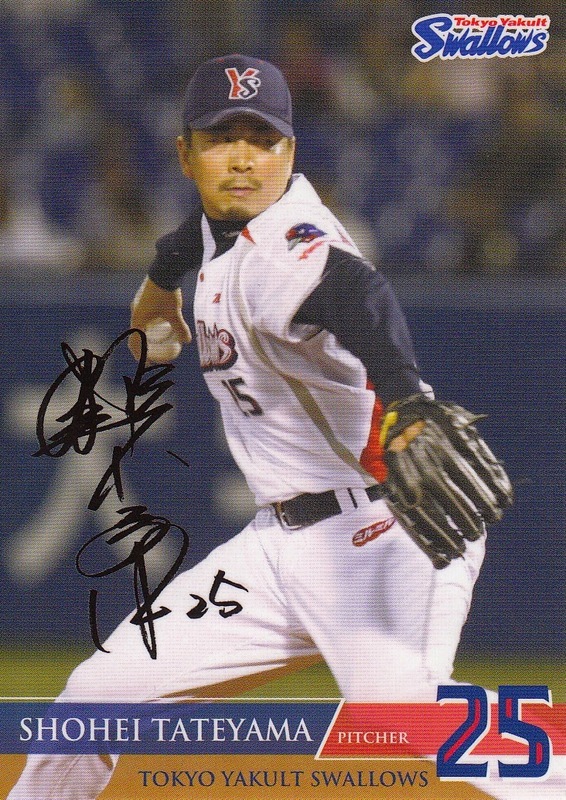 Murakami is the only one of the three to play in the majors. Whatever happened to the other two? 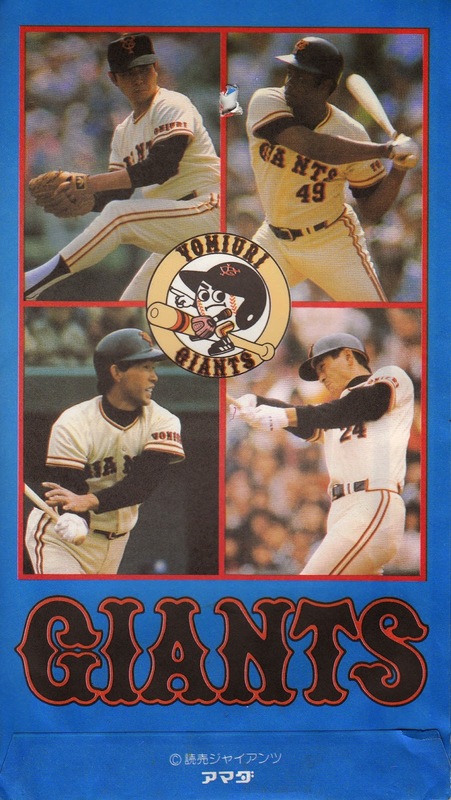 *FYI - the only future major leaguers on the Magic Valley team were Ken Henderson who had a 16 year career mostly with the Giants, White Sox, and Cubs and Bob Schroder who spent some time with the Giants over four seasons in the mid to late 1960's. 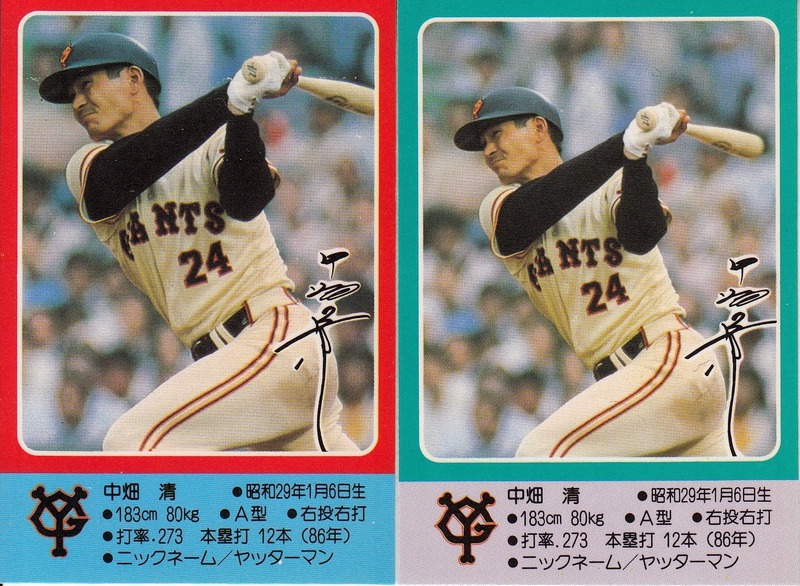 Both Takahashi and Tanaka returned to Nankai in 1965 (given the controversy over the Giants exercising their option on Murakami, it would have been surprising if Nankai had allowed them to stay in the US). 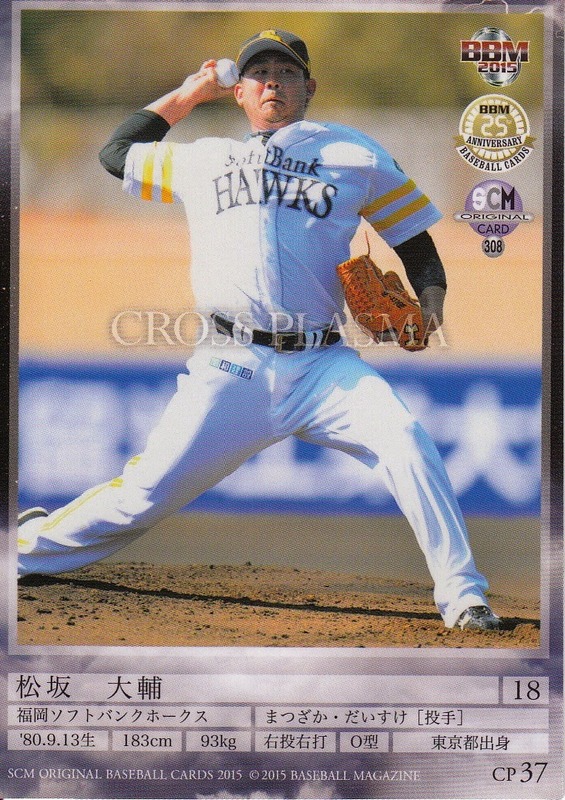 Their paths diverged pretty quickly after their return to Japan - Tanaka (whose Japanese stats at Baseball Reference don't link to his minor league stats) only appeared in 26 games with the ichi-gun Hawks over two seasons (1965 & 66). 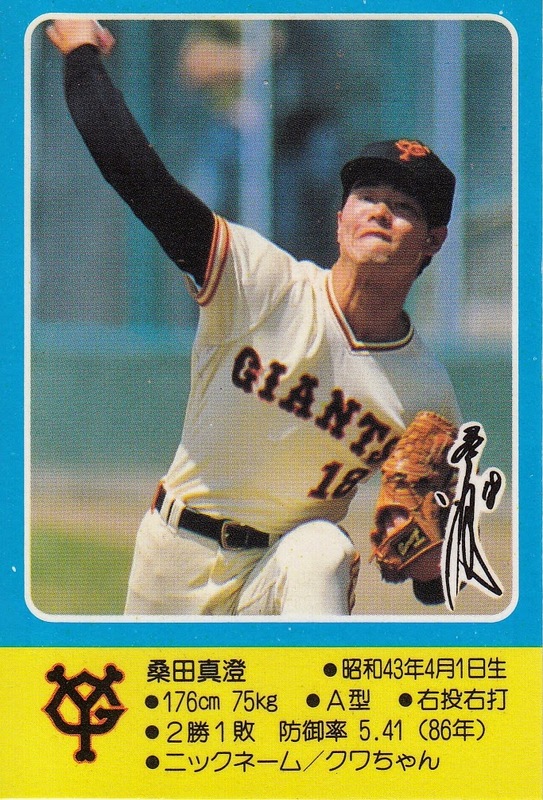 He switched to pitching (and changed his name to Tatsuhiko Yoshikawa) in 1968 but it didn't work out and he retired following the 1969 season (Source: Japanese Wikipedia). 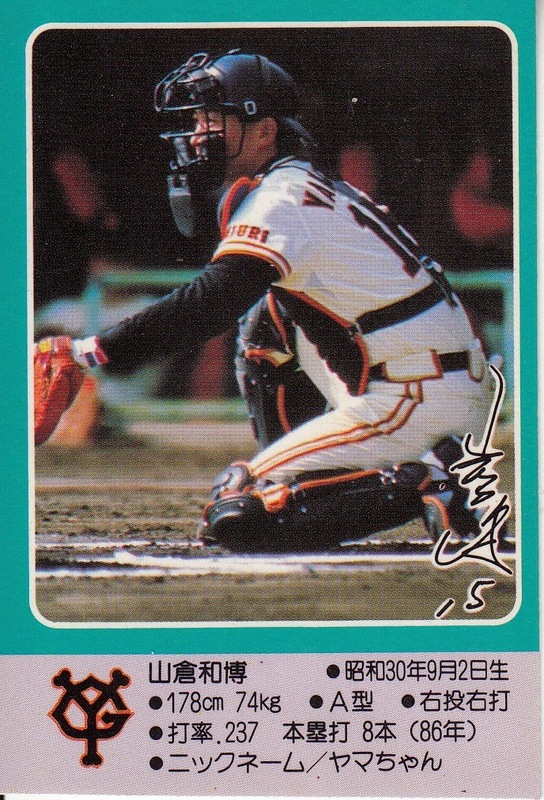 Takahashi, on the other hand, spent parts of 18 seasons playing at the top level in NPB - first for Nanaki, then for the Toei/Nittaku Home Flyers/Nippon Ham Fighters and finally for the Lotte Orions - before retiring after the 1982 season. 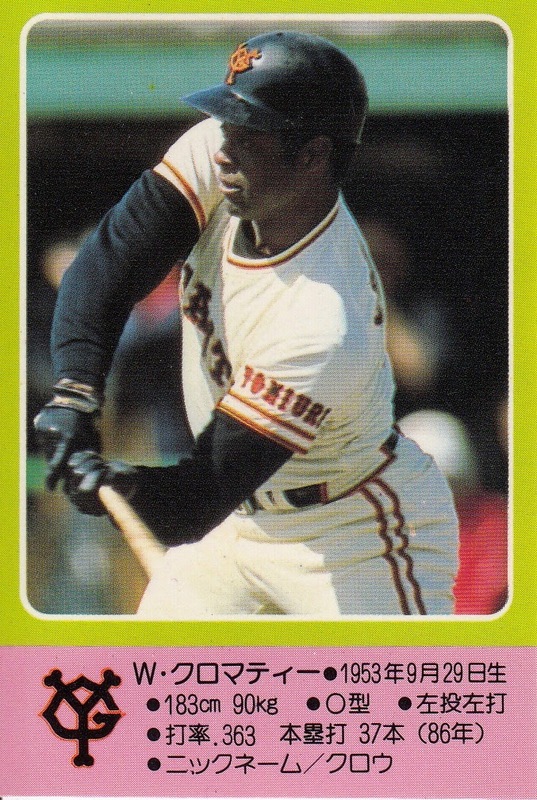 His primary claim to fame is that he was the first player in NPB history to play all nine positions in one game, pulling the stunt on September 29, 1974* (Source: Japanese Wikipedia). 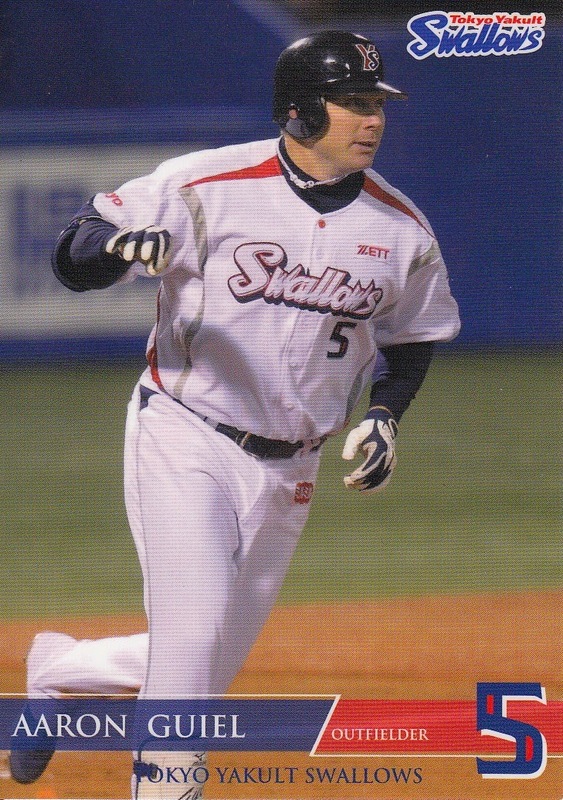 *For the record the only other NPB player to play all nine positions in one game was Akihito Igarashi of the Orix Blue Wave on June 3, 2000. As you might expect, there aren't a whole lot of cards of these two. 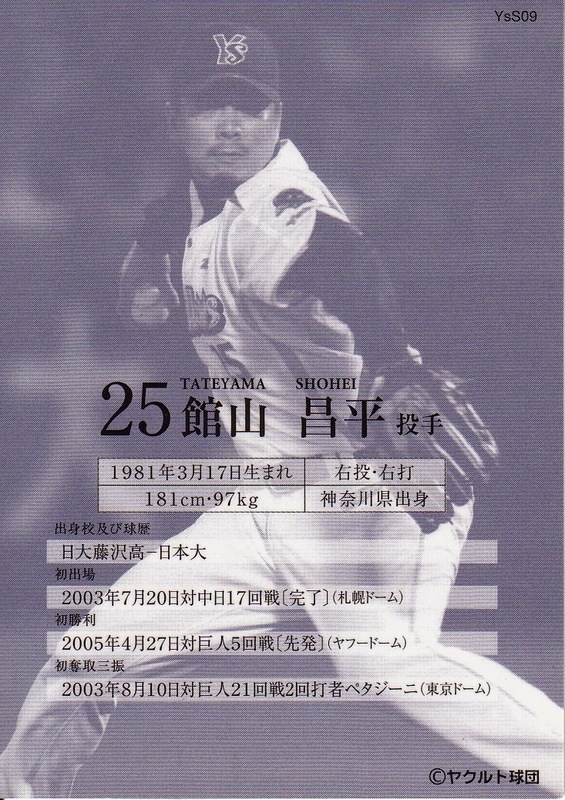 In fact, there are no cards that I'm aware of for Tanaka at all. 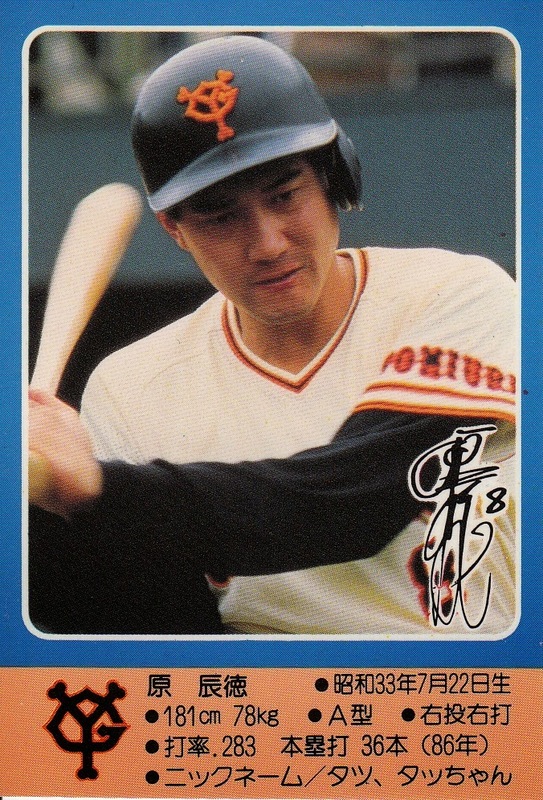 Takahashi has a grand total of four - two Takara cards from his final two seasons with Lotte in 1981-82, a card in the 2008 BBM Lotte 40th Anniversary set and a card in the 2010 BBM Memory Makers set. 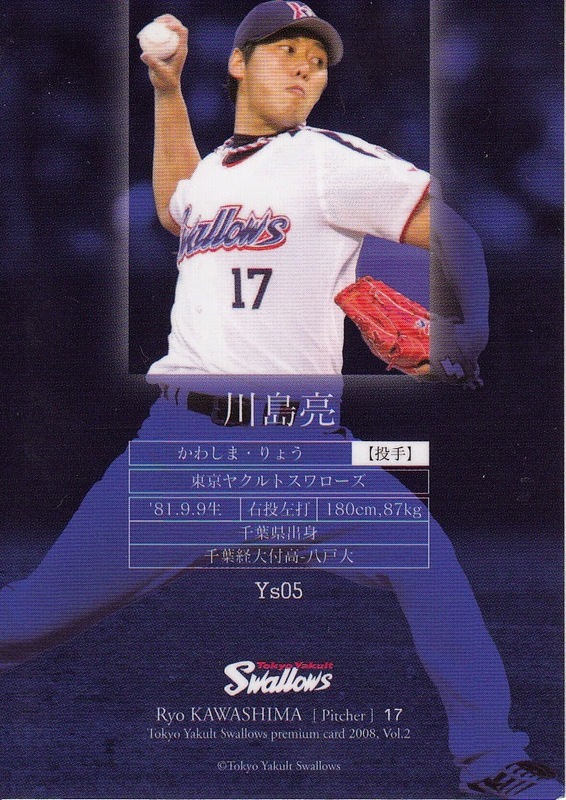 (SportsCardForum.com's Inventory Manager lists a couple cards for him with the Swallows in the mid 00's but that's not the same Hiroshi Takahashi). 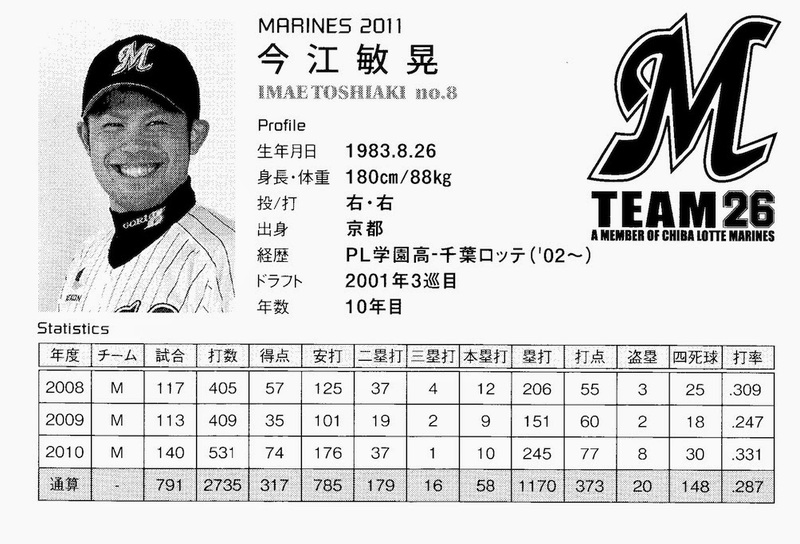 Here's the Memory Makers card of Takahashi (#029). The back mentions the game that he played all nine positions in but I don't know if the picture is from the game - his normal position was catcher. The other odd item I picked up recently (after the JBR 22 "taba") was another "taba" for a late 1980's set - the 1987 Amada "Heat Sensitive Giants" set (JGA 15). This one had 36 packs on a string with a cardboard cover over the whole thing. I got 30 unique cards out of the 36 packs in the "taba" which isn't too bad although not as good as I did with the JBR 22 "taba". I was a little disappointed because I already had five cards from this set and I got all five again but that's the risk you take when getting a bunch of packs for a small set. Ryan had mentioned the other day that frequently the tabas would have cards attached to the back cover. 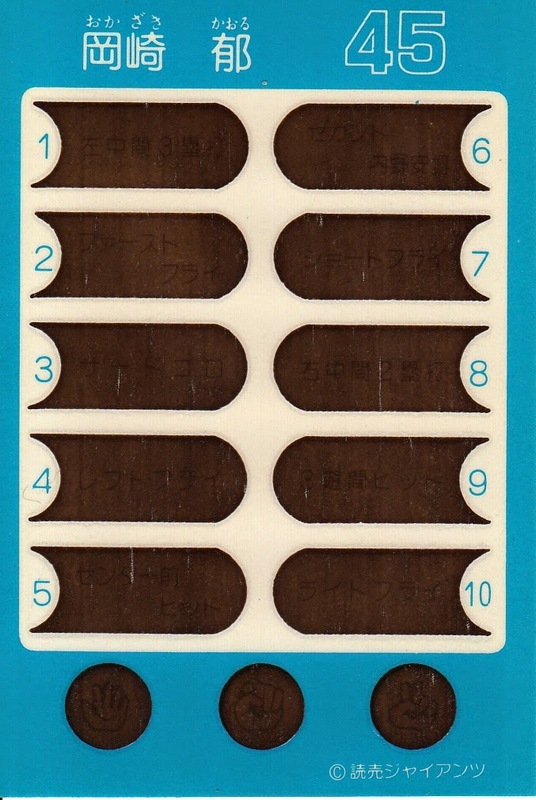 I think that in addition to serving as an example card, these might also be prize cards - cards given to the person who got the "winning ticket" (or a card stamped as a "winner"). So the idea would be if I pulled this "ticket" from a pack, I'd take it to the store owner and they'd give me one the cards from the outside of the taba. Unfortunately, there's no cards on the taba I got and I'm not sure what the prize cards for this set would have been anyway. BBM released this year's edition of the Rookie Edition set a little over a month ago. 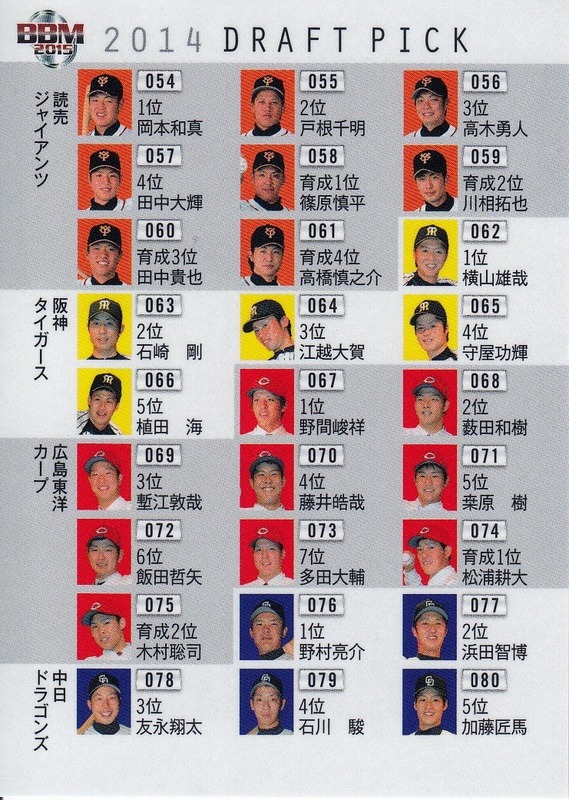 This is their annual draft pick set, featuring pretty much all the players who were taken in last October's draft (looks like the only guy not in the set is Yuichi Sato who was taken in the first round of the ikusei portion of the draft by the Dragons but did not sign with them). I find myself running out of things to say about this set every year - other than the players featured, it's pretty much the same set year after year - especially the last couple which has had the exact same subset to go along with the player cards. 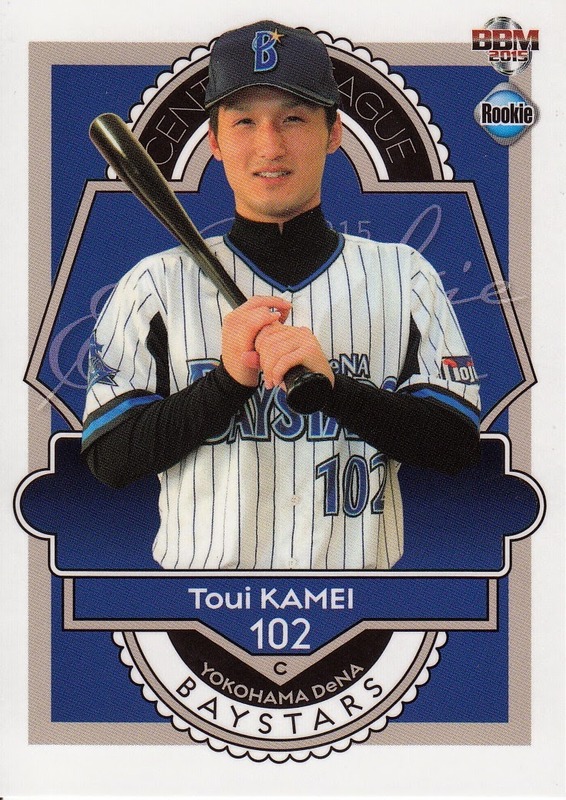 So let's get on with it - there are 103 player cards covering all the players who signed out of the draft, including those in the ikusei portion of the draft (who you may never see another card of again unless you get the team's BBM team set). 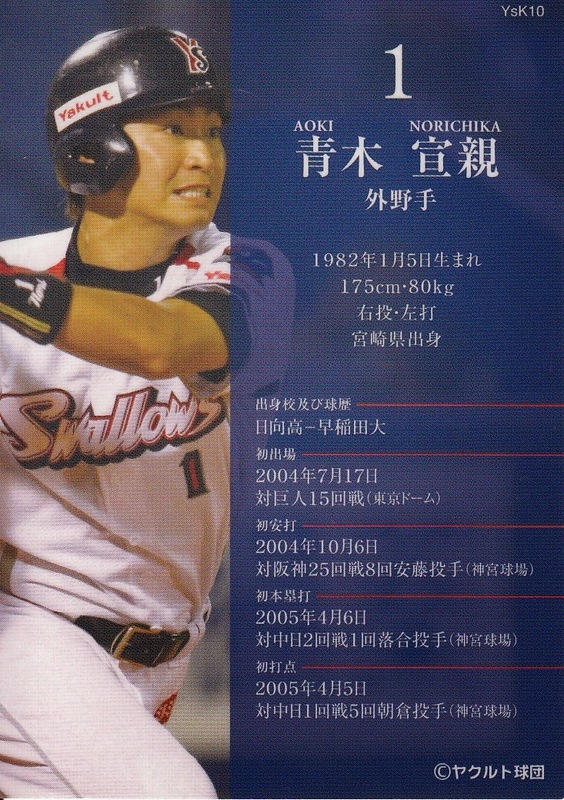 There are two cards that are kinda-sorta checklist cards - they show a head shot of each of the 103 draftees. 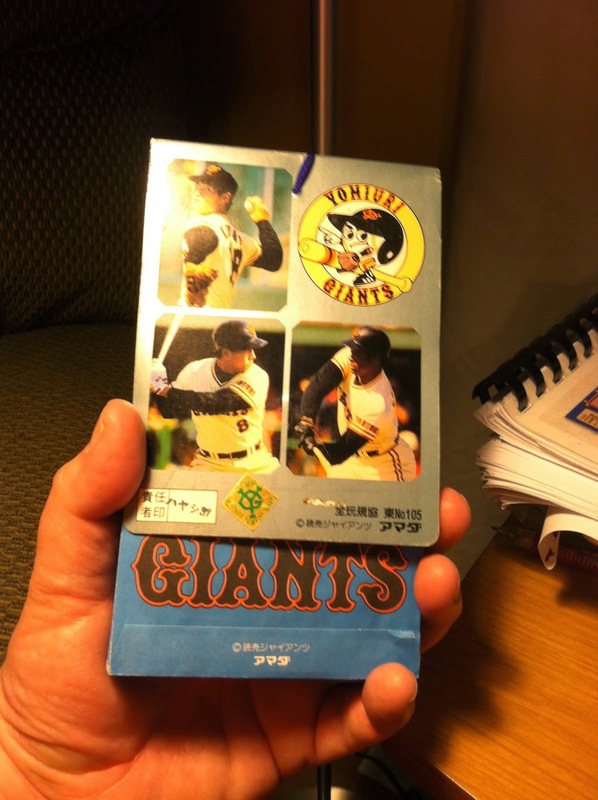 One card is for the Pacific League teams and the other is for the Central League teams. There's a 12 card subset called "Then & Now" that features two players on each card - the top draft pick for each team paired with another player from the past (some still playing, others retired). 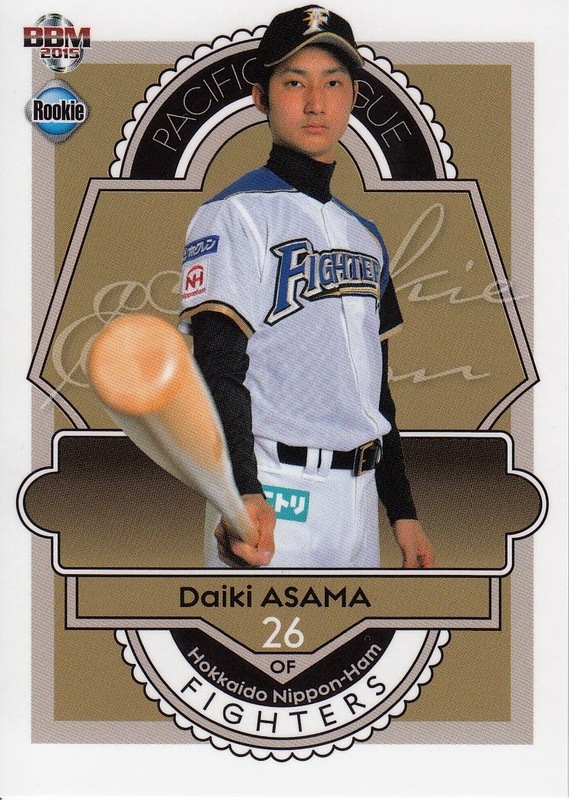 It's not entirely obvious what the connection between each pair of players is - the only one I know for sure is that Sachiya Yamasaki of Orix shares a card with his father Akihiro, who played for the Giants and Fighters from 1980-91. 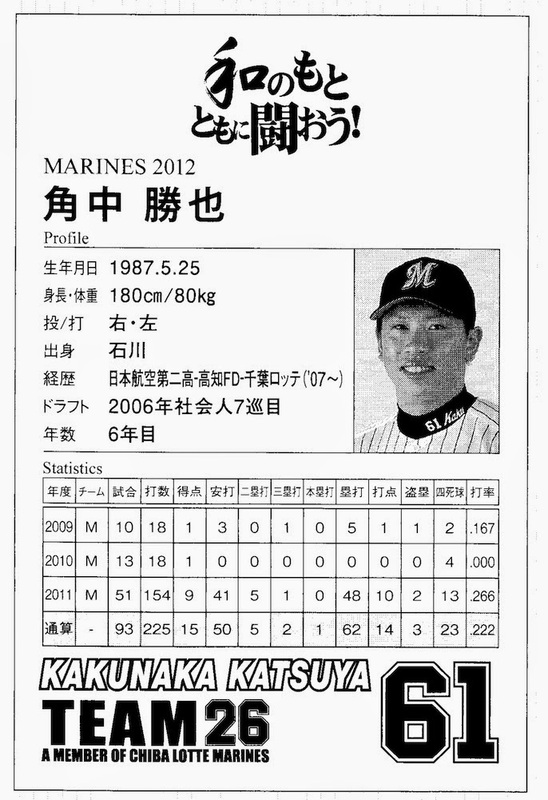 For the third year in a row Masahiro Tanaka is paired with the Eagles top pick - this year it's Tomohiro Anraku. For all my comments about the sameness of this set from year to year, it's not a bad set. 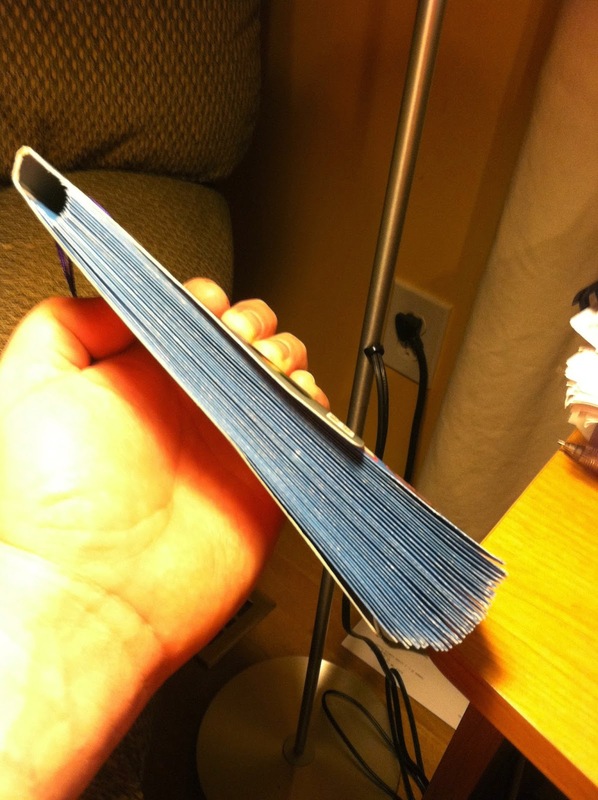 BBM used a thicker stock on the cards this year so they have some nice heft to them. The design of the player cards is a little busier than in the last few years - normally I don't like those kind of designs much but it's a nice departure for this set. I will voice my standard complaint about this set - it would be nice if the player pictures were something different than posed shots wearing the uniform of the team that drafted them. 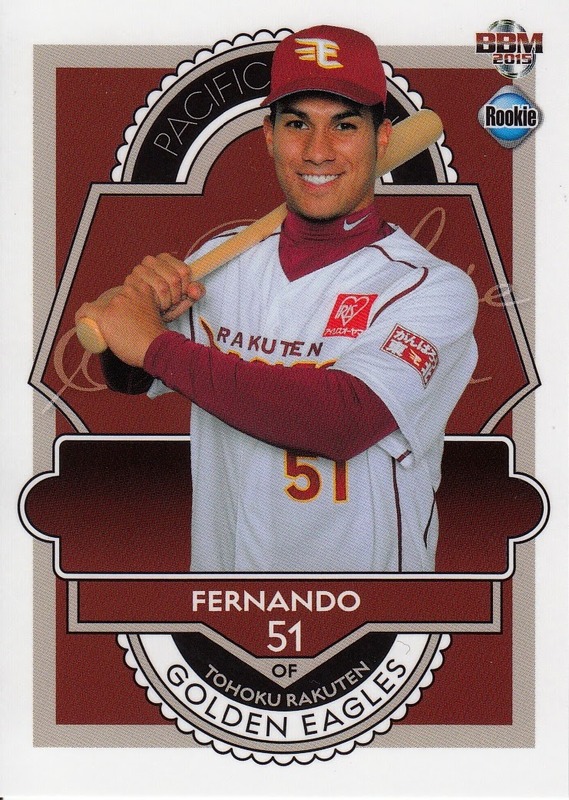 The best would be photos of the players in their high school, college, industrial league or independent league team uniform, but I'd settle for the senior prom/high school graduation photos like Topps used in the early 90's on their draft pick cards. Something other than the kinds of photos that BBM has used for 13 years now (16 if you count the draft pick cards in the 2000-02 Preview sets). Coincidentally, Ryan did a post on this set today also. And as always you can see all the cards over at Jambalaya.